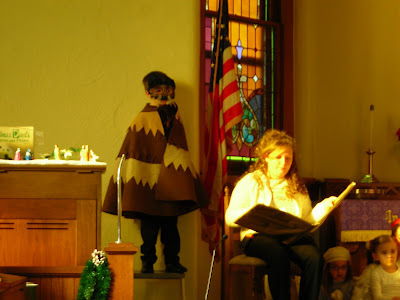 Our son was in his very first Christmas pageant at Church on Sunday. He was the wise owl who advised the mouse that going to Bethlehem would be "memorable." Except he couldn't say memorable, so the mouse was advised that traveling would be a "good experience." Ryan is standing on the stool on the left. The mouse is on the right. Various chickens and shepherds wait in the background for their part. The cow got a little sour and didn't come--but the show must go on! Little brother Justin proclaimed this the best play he ever saw. This owl is not only wise but tough. Two days earlier he got a foot-long scrape on his stomach when a feisty pig jerked on the gate he was leaning on. 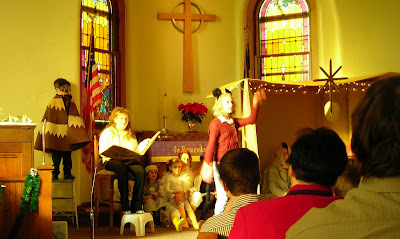 Only in small town America could the Christmas play possibly be derailed by a farm girl who couldn't moo and a kid with a pig fence injury.